Preachers still in existence today. ‘Wonder not that you have obtained so little fruit by your labours! You have spent them on barren soil, not yet watered with the dew of Divine Grace. When God willed to renew the face of the earth, He began by sending down on it the fertilizing rain of the Angelic Salutation. Therefore, preach my Psalter composed of 150 Angelic Salutations and 15 Our Fathers, and you will obtain an abundant harvest’. Mary taught Dominic a specific method for preaching the Christian truths of salvation - according to the mysteries of the Incarnation (later known as the Rosary’s ‘Joyful Mysteries’), Redemption (the ‘Sorrowful Mysteries’) and Eternal Life (the ‘Glorious Mysteries’). After giving the people a short teaching and reflection on each of the mysteries, Dominic would then lead them in reciting ten ‘Hail Mary’s. The Blessed Virgin revealed to St. Dominic that this form of prayer would be one of the most powerful weapons against future errors and difficulties. The following words were also attributed to Mary, ‘One day through the Rosary and the Scapular I will save the world!’. St. Dominic, upon returning to the French Cathars/Albigenses, preached so compellingly that almost everyone renounced their false beliefs, embraced this new form of prayer, and lived good Christian lives. Saint Dominic preached in this way for the rest of his life, and founded the Confraternity of Prayer, a kind of 'brotherhood', whose members prayed the Marian Psalter daily. 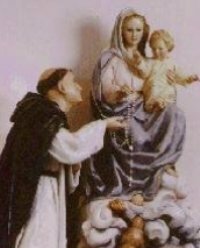 And so, Holy Church Tradition has upheld that the Blessed Virgin Mary entrusted St. Dominic with receiving the devotion of her Most Holy Rosary and giving it to the Church.